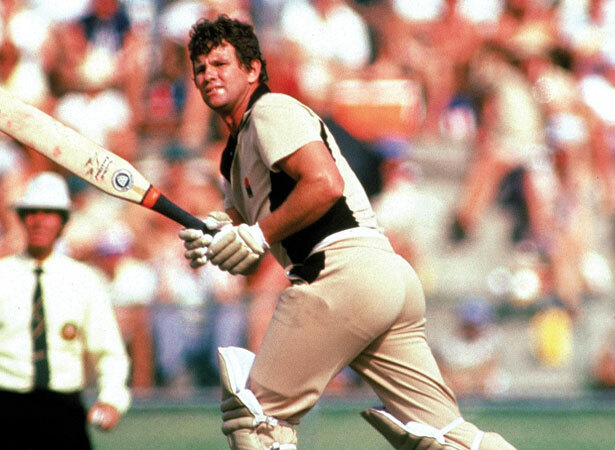 At 44/6 in reply to Australia’s 302, New Zealand was heading for an embarrassing defeat in the second final of the Benson & Hedges World Series Cup when Lance Cairns took guard with the bat dubbed ‘Excalibur’. Fast bowler Dennis Lillee welcomed him to the crease by hitting him on the head. The burly swing bowler’s response was to swipe two sixes off three balls from Ken MacLeay. Then he despatched Rodney Hogg over long-on off two consecutive balls. When Lillee was brought back to deal with him, Cairns swatted the great man one-handed over the fine-leg boundary before flogging him over mid-off. It was too good to last. Cairns carved a full ball from Geoff Lawson straight to cover and was dismissed for 52 from 25 balls. New Zealand lost the match by 149 runs, but those gigantic hits live on in memory. Lance Cairns played 43 tests, taking 130 wickets at an average of 32.92. In 78 one day internationals, he took 89 wickets at 30.52 and scored 987 runs off just 941 balls. We have 4 biographies, 1 article, related to Lance Cairns hits six sixes at Melbourne Cricket Ground .